I couldn’t refuse myself a pleasure to queue into King’s Rest yesterday. I’ve picked Kargash for the run – for whom almost every 355 drop from the dungeon was most welcome. Barely 5 minutes of dungeon finder, and there we go. 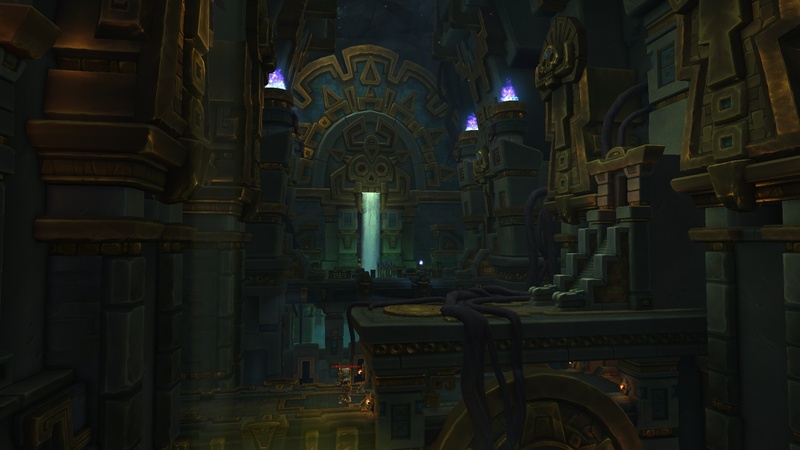 The dungeon is essentialy a tomb of ancient Zandalari kings, so no wonder we fight mostly ghosts and construct guardians there. For reasons unknown the tomb is abandoned – with all its gold inside. Trash was very nasty. One time I didn’t even get what one-shot me – nothing was around me, ticking or flying in my general direction, and even recap was not available after death. I’ve used the whole range of my arsenal there – including sheeping, disenchanting Minions of Zul (yes, the very same ones from the raid), everything. Bosses posed little to no problem though. For the first one, the skeleton winged serpent, you need to drop the golden spits somewhere away from others, and this is basically it. There are also adds coming which you must stop from reaching the boss, but once they arrived it was already at 10%, so we skipped this. The third one is a boss trio which proved to be the hardest (not that we didn’t kill it on our first try though). The mechanic is very much alike the mogu chieftains in Mogu’shan raid. You fight the three zandalari guys one by one. Once killed, another pops up, but the most nasty ability of the previous one stays until the end of the fight. First you deal with the boss rolling towards a random player, and all others must step in the line to reduce damage. The second one launches moving blade circles, freaking dangerous. The third one casts multiple nasty totems in different sides of the room, and you have to deal with them, the roll, and the incoming blades while picking at the boss. Needless to say, at the end the battlefield reminds a mess where you simply cannot find a safe spot. The final one is King Dazar – or should I say, a skeleton of him. I can’t remember anything too difficult about the encounter – we bombed him to 20%, then he launched a fast moving AoE around the whole room which we had to escape. He was down very quickly. All in all the dungeon seemed a lot easier than Siege of Boralus – comparing the heroic modes. The most precious thing here is the Indiana Jones or Tomb Raider vibe. You certainly feel the adventure spirit while at Zandalar continent, but this experience just makes it complete. An eerie, majestic complex with passages, fathomless depths, gold everywhere and reeking of death and ancient riches – all that we like in the movies. It’s hell of an adventure, and strongly recommended. Another important thing is a piece of lore. Throughout the whole dungeon, right from the entrance, Shadow of Zul is haunting you and is responsible for awakening most of the ancient trash spirits. His final goal is to wake the King Dazar and make him a servant of G’huun, but once we beat him, the king thanks us and urges to hurry end the G’huun’s plague. Another piece of puzzle in the lore of Zandalar. Could we live without it, already motivated enough for Uldir? Yes. But does it spice up the overall story? By large! My drop was an ugly dagger – 340->350, not the feet that I hoped for, and it brought my ilvl only 348->349. But what do you know, the first rare kill upon arriving in Arathi just gives me these feet, and now all nine level cap toons are into the latest raid :) Is this luck, or Blizzard have adjusted the drop chances? P.S. Alert! Love is in the Air! King’s Rest is one of my favorite dungeons for aesthetic and overall atmosphere. The bosses are fun, but doing the trash on Mythic Plus is not great! It’s cool that the early trash in here also prepares you for elements of the Zul fight in Uldir later – not often you get that anymore. Yes I love that about some trash! The preparing, similar mechanics as the boss ahead. Never try to use mage spellsteal to destroy minion of Zul. Minion will die, but you’ll get its buff – the damage-absorbing shield which, when depleted or dispelled – or clicked off – kills its wearer. Ah, I guess that could explain my insta-death. Still it was worth it, disposing of the whole batch of them single-handed. Not that I’m revisiting it anytime soon anyways, I’ve seen the story.